The Daily Believer is your daily-ish dose of whAUtever, a dose that grows by the second, minute, hour, who knows. Maybe there’s something going on tonight at the Gnu’s Room. Maybe there’s a volleyball game. Maybe there’s some update to The War Eagle Reader you need to know about. Maybe last night’s episode of How I Met Your Mother referenced Bo, or had a nice, faux vintage Auburn t-shirt all up in it. Maybe Pat Dye’s Pants have no reserve on eBay. In other words, we’re live-blogging Auburn – town, gown, idea – and we need your help. Are you putting on an event? A show? Let us know. Know about one? Let us know. Spot Chizik at Byrons? Let us know. Did you see that episode of House? Let us know. Check here – the same post. Check AUften. 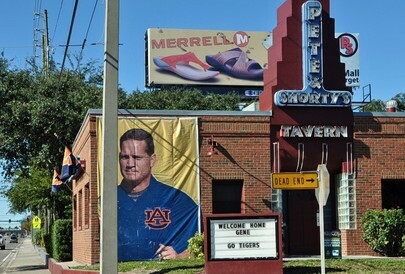 *** “Welcome home Gene”: When in Tampa, visit Pete & Shorty’s Tavern. Did you know that Gene Chizik taught third grade in the Tampa area right after graduation from Florida? Click here for the rest of the homecoming story.